Eight years ago, Emmanuel College's future looked bleak. Cash-strapped, with fewer than 500 students, the small school in Boston's Fenway neighborhood stood at a precarious crossroad. But Emmanuel held a trump card, a coveted acre of its campus near the burgeoning Longwood Medical Area. College officials had long held the land in reserve, like a valuable family heirloom to be sold only as a last resort. With its prospects in doubt, New England's first Catholic women's college began searching for a savior. The school's longtime president, Sister Janet Eisner, found an unlikely source: the pharmaceutical giant Merck Co., which agreed in 2000 to lease the land for 75 years for approximately $50 million, with no strings attached. The windfall and subsequent alliance with Merck allowed the college to add dormitories so it could begin admitting men the following year, and sparked a sustained revival that has made it one of the fastest-growing colleges in New England. Emmanuel's geography, which had confined it to relative obscurity in the college-sat urated Boston area, turned out to be its deliverance. "We held on for as long as we could," Eisner said. "But what's happened since has certainly exceeded our best expectations." The striking turnaround for Emmanuel is a study in contrasts. A nun brokering a landmark real estate deal. A small liberal arts college joining forces with a research colossus. A school traditionally known for training teachers using the windfall to help in landing millions in federal science grants and help building a $50 million new science center scheduled to open in 2009. Higher education observers said Emmanuel's decision to lease the land to Merck marked a creative strategy for elevating its profile and avoiding the fate of the dwindling ranks of women's Catholic colleges. "It's an amazing story," said Kathleen Dawley, president of Maguire Associates, a higher education consulting firm in Concord that has advised Emmanuel. "It wasn't just about leveraging resources; it was about careful planning. There was little luck involved." Emmanuel's transformation, while unorthodox, has been undeniably successful. Since 1999, enrollment has risen from 466 to 1,741 students, applications have risen eightfold, and the faculty has nearly doubled in size. Its revenue has tripled, and the endowment, bolstered by the proceeds of the lease with Merck, has soared from $8.6 million to $85 million. In turn, the college, founded in 1919, has embarked on an ambitious building campaign featuring a state-of-the-art student center, which opened in 2004 as the first new building on campus in 35 years. The same year, Merck opened its 12-story building, whose glittering glass facade towers over the college's main quad and its English Gothic buildings. Some 350 scientists conduct first-line research on cancer and neurodegenerative diseases such as Alzheimer's at the facility. Other Fenway-area schools, in particular Simmons College and Wentworth Institute of Technology, have also shown strong growth in recent years. But Emmanuel's revival is eye-catching. 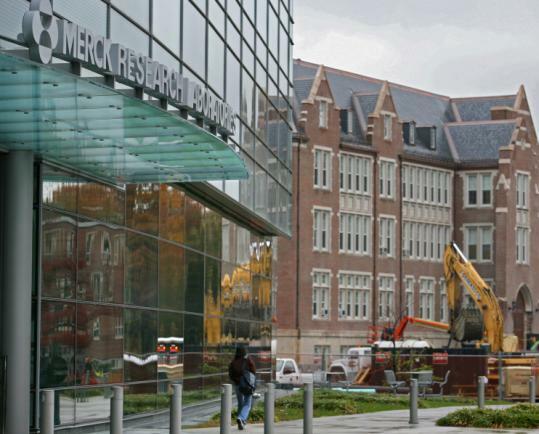 Mark Goulet, executive director of drug design and optimization at Merck Research Laboratories Boston, said its proximity to the hospitals and the collegiate atmosphere draws prospective researchers. "It doesn't feel like Kendall Square with a lot of budding businesses," he said. "It's more of an academic feel, which is a great fit for us." Merck has provided more than financial benefits. The company endows several scholarships for Emmanuel science majors, and contributes $50,000 to the college's summer research programs in biology and chemistry. It reserves one spot in its competitive summer internship program for an Emmanuel student, and donates tens of thousands of dollars in lab equipment. Merck researchers headline a monthly science seminar series, and there are discussions of greater collaboration in the labs and classrooms. A Merck employee even coaches the Emmanuel women's volleyball team, and many employees use Emmanuel's fitness center. Corporate-academic partnerships such as the new research collaboration between Massachusetts Institute of Technology and Novartis are increasingly common in higher education, but the alliance with Merck is unusual because of the impact of the deal, which has overhauled the school's image and focus. The college has expanded its slate of science courses by 50 percent in the past five years, including a new neuroscience department, and plans to open a new biochemistry program next fall, said Frank Scully Jr., a chemist who became the college's vice president of academic affairs in July. Faculty members say that despite the potential tension between a small college and a large corporation - including fears that companies will influence the way a college is run - the relationship has been productive and smooth. Josef Kurtz, a biology professor, said the prospect of a collaboration with Merck helped draw him to Emmanuel four years ago. In guest lectures, Merck employees give students a glimpse of private-sector experience and expose them to a range of potential careers in the field, he said. "It's phenomenal for me as a faculty member. I can teach at a small liberal arts college while also being part of the larger scientific community," he said. Merck's donations allowed him to hire four students last summer to help with research projects on diabetes and bone marrow transplants, he said. "There are no strings attached," he said. Emily Winner, a senior biology major who worked last summer at Merck on a research project on Alzheimer's-linked proteins, said the college's ties with Merck were a major reason she came east from Michigan for college. "I didn't want to spend my time at college exclusively on the campus," she said. "I wanted to branch out and experience the real world. The internship really opened my eyes." Some Catholics have criticized Merck for pressing state governments to mandate the cervical cancer vaccine for girls entering puberty, before abandoning the campaign earlier this year. Discussions of the school's ties to the company have made the rounds on blogs devoted to Catholic colleges, with commentators seeing a potential threat to Emmanuel's Catholic identity. But Eisner and Merck officials said the company agreed from the outset that it would not use the facility for research that violated Catholic doctrine. Emmanuel and Merck officials decline to discuss details of the agreement, but said scientists were not conducting research on embryonic stem cells or aborted fetal tissue. "There are certain kinds of research that just aren't allowed on a Catholic campus," Eisner said. "We know that, and they know that." Many students say Merck has little effect on their daily life, but some express reservations about Merck's presence. "I chose Emmanuel because it is a Catholic college," said senior Marissa Choiniere, president of the college's Republican Club. "The fact that they have a partnership with a company that doesn't always conform to Catholic beliefs is a little troubling. If I were running the school, I wouldn't have struck up the relationship." Lester F. Goodchild, an education professor at Santa Clara University who studies Catholic colleges, said Emmanuel's savvy gamble helped separate it from the "thicket of colleges" in the area. Eisner agrees, but also believes a higher power may have smiled upon the college. "No doubt in my mind," she said. "We were always faithful to what we were all about."